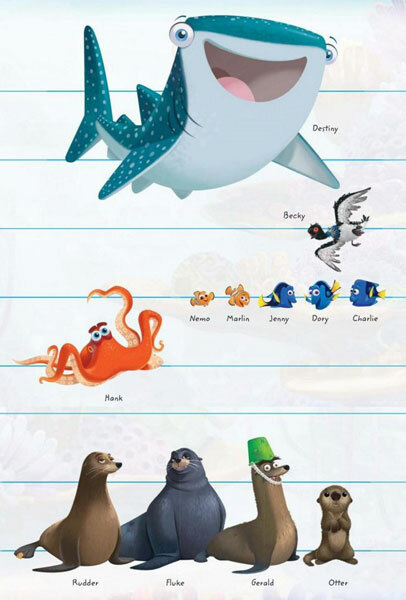 Since its release in 2003, Finding Nemo has become the most popular & most watched Pixar film. So it comes as no surprise that the sequel, Finding Dory, was much awaited, and was welcomed with a lot of excitement & enthusiasm. Now that it has reached the theatres, we bring you seven interesting facts about the movie that you may not know. Can you imagine Finding Nemo without Dory? Neither can we. But there was a version of the film without her. Dory was never part of the original story. In fact, Marlin was supposed to have a male sidekick, and Gill was the top contender. It was while watching episodes of Ellen that director, Andrew Stanton struck gold. He noticed Ellen DeGeneres (voice of Dory) change the subject five times before completing a sentence. This gave him the idea of a character that was forgetful, and Dory came into being. Of course, Ellen was the natural choice to voice the character. Dory’s memory loss was also partially inspired from the fact that in real life a goldfish can only retain things up to 3 seconds. Andrew Stanton returns as the director of the sequel. He was the natural choice because the sequel was his idea. In fact, he wrote a draft of Finding Dory during the post production of his live action movie, John Carter. He and his team worked around concepts of global warming, conservation and taking care of nature in the story. But they made sure that it did not become preachy. A lot of the original voice cast returned, along with music composer, Thomas Newman. Newman won the Annie Award for Finding Nemo, along with BAFTA & Grammy for Skyfall, and a Grammy for Wall-E. We are keeping our fingers crossed for Finding Dory. 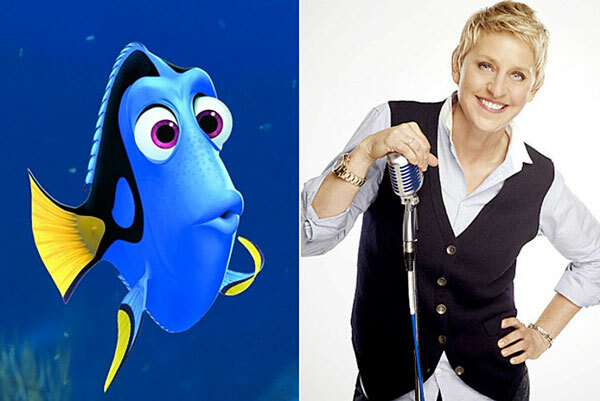 Most popular for her talk show, The Ellen DeGeneres Show, Ellen DeGeneres returns to her role of Dory. In fact, she is known to be waiting for the sequel since recording for the first film. When the sequel was finally decided, she was the first one to receive the news. After all, it was Ellen’s comic timing that inspired the writers to make the sidekick female in the first place. For the sequel, Ellen came on board much early. She was instrumental in making Dory’s character less annoying and more lovable. She recorded more than 500 lines by the end of production, and often gave the writers ideas about Dory’s character & journey. She was so crucial to the entire process that a lot of voice casting was done based on her chemistry with her guests on her talk show. Stanton wanted actors who would complement DeGeneres’ sense of humour, and that is how Diane Keaton, Ed O’Neill, Ty Burrell & Eugene Levy joined the cast. Hank proved to be the most difficult character for Pixar animators till date. Since Hank was an octopus, there was no bone structure. Animating a creature with bone structures is easier since the movements are restricted. But with an octopus as a primary character, the movements became unpredictable & full of surprises. Moreover, it has over 350 suction cups on his tentacles, each with individual movement. It took the team a whole year to make Hank’s movements look believable. They took references from the movement of Ka (The Jungle Book). Another challenge was to give Hank expressions. Since the mouth is at the bottom of the arms, the expressions were put in the eyes. Maintaining the theme of differently-abled characters, Hank was made a septopus; he’s missing a leg. With so many challenges, it hardly comes as a surprise that the most painstaking shot in the film is Hank’s introduction. It took 18 different artists to produce 146 versions of it over a course of 13 months. In Finding Nemo, Dory was a side character. But now she was the protagonist. Obviously, everything had to be from her perspective. In order to get this right, around 10 to 11 drafts were written. One of the drafts had the idea that they would fix Dory’s memory loss. But it was unanimously decided that the memory loss is an integral part of who her nature. So the story became about her becoming comfortable with her flaws & self-sufficient. Here on, the central driving idea became that Dory will be fine by herself. Another crucial change was made to the ending of the film after watching the documentary; Blackfish. Since a large part of Finding Dory was set in a Marine Research Institute, the documentary gave the team the idea that the fishes should have the choice to leave. Not all the characters from the first film made it to the sequel. Only those who helped Dory’s story move forward were kept in the movie. And a host of new characters were added. In fact, the movie has the most diverse cast of characters with different movements that Pixar has ever worked with. This meant a lot of research and learning for all the departments. The filmmakers had to learn about ocean biology, and the animators used real ocean images as references. The team took thousands of photos at aquariums from the fishes’ perspective. This is what makes the scenes underwater authentic. If that were not enough, over a 1,03,000 storyboards were generated for the film over a course of 3.5 years. Animators even built blueprints to understand how each fish swims. There was a clear difference maintained between the underwater world and the human world. The ocean was made up of soft shapes and solid colours to imply safety & warmth. In contrast, the marine life institute contained harsh lines and is uses desaturated colours. To maintain the focus on the fishes, all human characters were kept in shadows. This is the first Pixar film to be rendered on RenderMan/RIS. This means that Pixar changed its rendering software for the first time in 30 years. As opposed to Renderman, REnderman RIS allowed the team to create both direct & indirect light sources. They could also handle light under water more smoothly than before. Tell us what you enjoyed the most about Finding Dory? Is there any other side character that you think Pixar should make a movie about? Let us know in the comments below.